HTC has the knack for creating little unique selling points for what would otherwise be vanilla products. 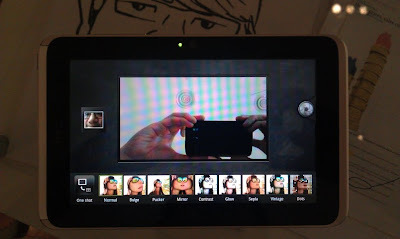 It’s Sense UI for Android phones, for instance, is one of the best around and heartily recommended by reviewers. 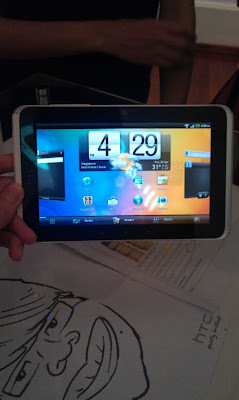 With HTC Flyer, the Taiwanese company has once again brought something different to differentiate itself from all the “me-too” Android tablets flooding the market. For one, HTC is building in what they call the HTC Scribe, a proprietary pen input method. But here’s the million-dollar question: is it worth the steep S$1068 price tag? First, a little about the Flyer. 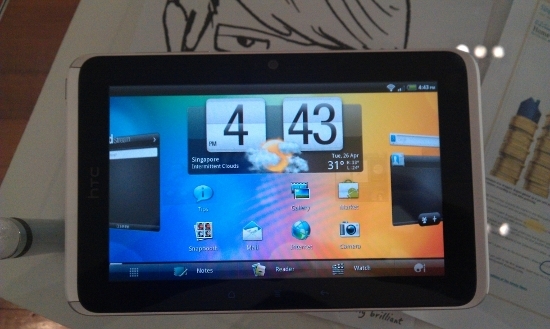 It has a 7-inch (1024 x 600) touch screen which is bright and crisp. It comes with 32GB of internal storage, which is further expandable via a microSD card. A 5-megapixel camera capable of taking 720p videos sits at the back and a 1.3-megapixel front-facing one lets you video call and take pictures of yourself. A smooth aluminium unibody wraps around a rubbery plastic material which is nice to touch, and the device has solid heft to it. The standard Android buttons line the bottom of both the portrait and landscape orientations. 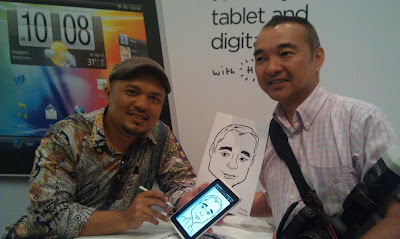 Powered by a 1.5GHz Qualcomm processor with 1GB of RAM, the tablet runs Android 2.3 Gingerbread with a version of Sense that is customised for the Flyer’s larger screen. Why not Honeycomb, you ask? Well, HTC has put a lot of work into this version of Sense for the tablet, and it really shows once you pick it up and start using it. Due to the various restrictions placed on Honeycomb by Google, HTC says they will need some time to customise it appropriately. Rest assured that an upgrade to 3.0 will be sent your way as soon as it’s ready. But honestly, it’s not a dealbreaker. There’s a dearth of Android tablet apps at the moment anyway, and we’ll probably still be looking at Sense no matter which version it gets bumped up to. The new Sense is similar to the one on the HTC Sensation, with slick new animations and an unlock screen that lets you jump straight to a particular application after unlocking. 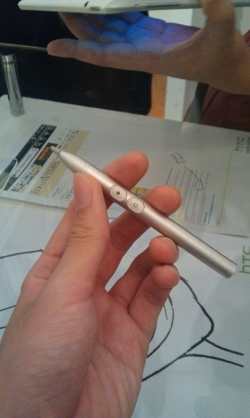 This is the Scribe technology HTC is talking about: A short little pen with two buttons. 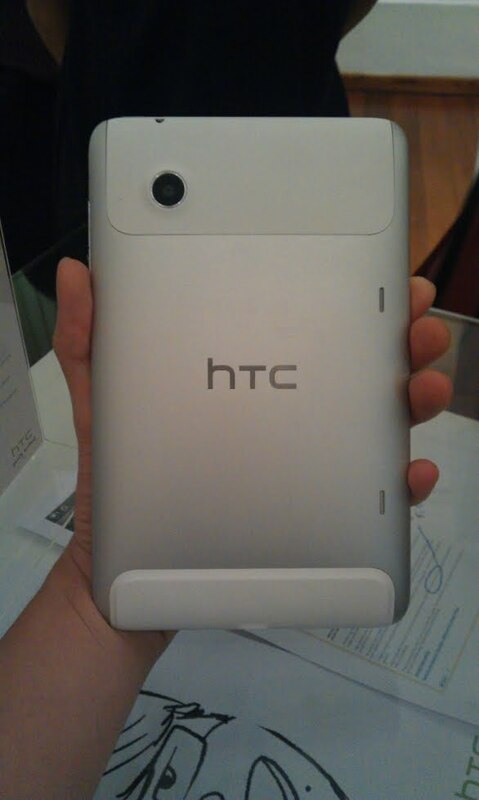 To make it as small as possible, HTC chose to power it with one AAAA battery. Yes, you read that right, 4 A’s! I confess I’ve never heard of such a battery until today, and I imagine it won’t be easy to find shops selling batteries of this size. The pen works great for note-taking and general scribbling, although there’s one disconcerting drawback: it’s only for writing and scribbling and you can’t navigate around with it. If you try touching the screen with the pen at a screen other than an app which supports pen input, the Flyer will automatically take a screen capture. Yes, HTC brings screen capture to Android at long last! Are you watching, Google? The bundled HTC pen is not the same as any generic capacitative stylus. While a capacitative stylus will expectedly work like your finger, you can only use the HTC pen within apps that support it. At the moment, that means only HTC’s built-in note-taking and photo-editing apps. No word if 3rd-party developers can take advantage of it. Use the pen anywhere else and the Flyer will automatically take a screenshot of that screen, whether it’s a webpage, your app drawer, or your homescreen. You can proceed to immediately scribble and paint on that screenshot, then either share it with your friends or send it wirelessly to a printer to print it out. 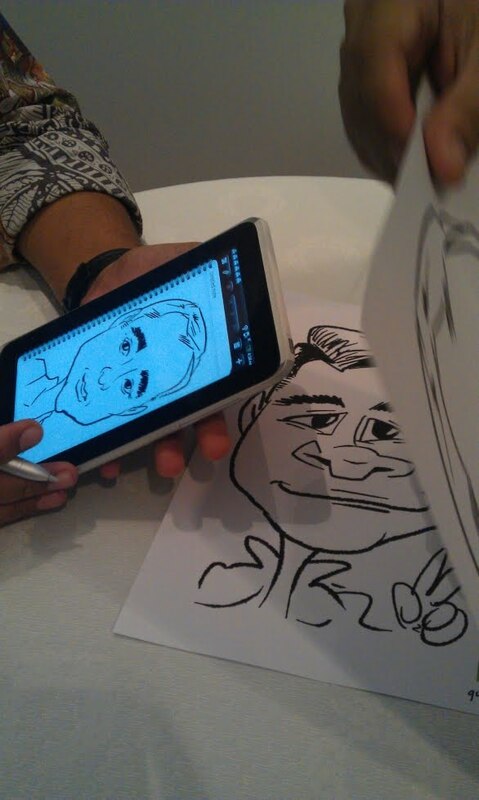 The pen will not work with any other screens; it’s specifically engineered for the Flyer with HTC’s proprietary tech. In other words, this pen does not work like your good ol’ Windows tablet’s stylus, and it takes a while to get used to. For a moment, I forgot how it works and tapped on an app icon. I then stood there stupidly waiting for my app to load, not realizing that a screenshot has been taken and I’m now looking at a picture, even though the screen flashed to inform me a screenshot was taken. It’s admittedly not very intuitive. I would rather have a separate method of taking screenshots (like the iPhone’s elegant way) and just let the stylus work like a stylus. What’s more, if you’re writing something with your hand resting on the screen, there’s a chance you might bring the keyboard up on-screen. This might sound inconsequential, but it starts to get annoying after it happens for the 500th time. But other that than, the pen works like a charm. There are definitely benefits to writing something out compared to typing it out, and the ability to quickly scribble out charts and graphs can help us visualise information easily. And if your drawing skills are somewhat lacking like mine, you can also snap pictures and embed them in your note. The notes app is linked to the calendar, so you can quickly start a note when you attend a pre-listed meeting. It’s also linked up to Evernote, so you can sync your notes and store them in the cloud. On the downside, you can no longer say to your boss you forgot to complete a task because you lost your minutes of the last meeting. 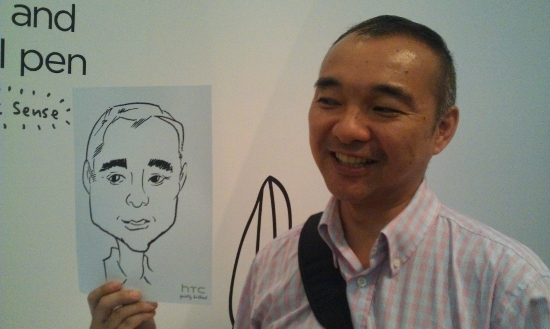 The best thing about Scribe is what HTC calls Timemark. Timemark is basically real-time audio recording in line with your note-taking. As you write, the Flyer records the audio of your meeting, lecture etc. When you review your notes and stumble across a part where you think, “What was going on when I wrote that?” Timemark will let you play back the audio recording at that very moment, helping you jog your memory. Part of the reason the Flyer carries such a hefty price tag is because of HTC Watch, a movie streaming service that the company is working to bring to users by Q4 2011. The service could possibly be free of charge, but nothing is confirmed as yet. For now, we can only watch movie trailers through the app. The situation for OnLive cloud gaming is slightly murkier. Currently available only in the US, HTC is still trying to negotiate licensing deals with game makers to bring it to Singapore. There’s no timeline for this, so it could be a long wait. 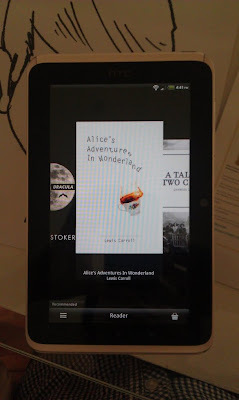 The e-reader app, like on HTC’s smartphones, is powered by Canadian company Kobo and comes with several public domain titles preloaded. Unlike the Kindle, you can actually buy and download books off Kobo, which is a huge plus. Territorial rights still exist, however, so not all e-books will be available for purchase. As a student, I can see many scenarios where the Scribe can save my life. It can also help me live a more environmentally-friendly live, as I probably kill a hundred trees every year just printing my notes and lecture slides. And it’s not just students who benefit; people who need to take regular notes will find the Flyer a attractive. When HTC Watch and OnLive arrive, the Flyer will make a pretty good entertainment tablet too. After all, there’s built in virtual surround sound, powerful dual speakers and support for a good range of media formats. Still, it’s hard to justify spending over a thousand dollars on it, when you can get a bigger screen tablet such as the Motorola Xoom for a lower price. 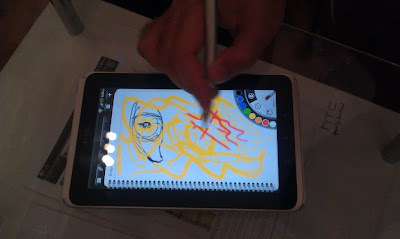 You can simply purchase a capacitative stylus separately if you really need pen input. On the other hand, HTC will partner with telcos when it goes on sale, so we can expect some subsidies. But Scribe with Timemark is a unique piece of software than no other tablet manufacturer offers, so if you need something like this on a regular basis, the Flyer is a no-brainer purchase. Do you think the Flyer is a good buy? Let us know in the comments!